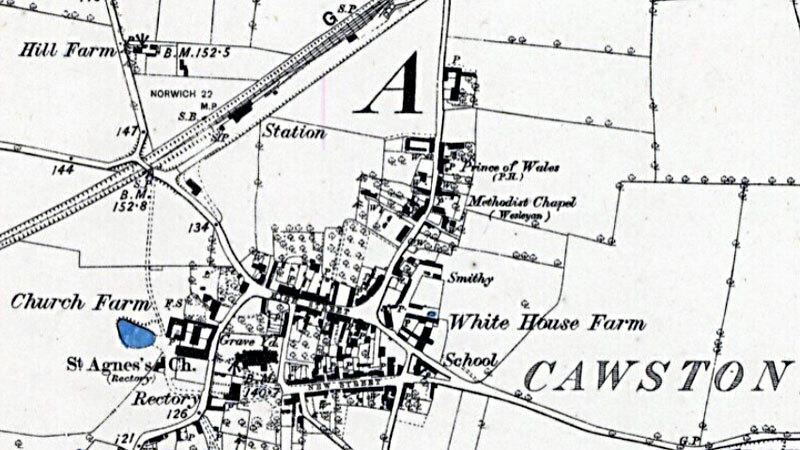 Cawston smockmill stood at Hill Farm just to the east of the Heydon Road. The mill was self winding and in 1831 was using one pair of patent sails to power two pairs of French Burr stones, a flour mill and jumper. However, by 1869, the mill was using 2 pairs of sails and was also driving a small set of Peak stones. A horse mill was also operated from the premises in the 1820s. Brettingham Robins, baker of Cawston, owned the mill in 1782 and on 20th November that year he made a will bequeathing to his children my Windmill that standeth upon Cawston Heath or Warren. Will dated 14 May 1808. All property including Windmill to be offered to Joseph Robins at independent valuation, proceeds to be distributed. If refused, all to be sold & proceeds distributed. Wanted within one month from the date hereof, a single man, one that can be well recommended as an experienced, sober, steady & active miller may meet with constant employ by applying personally to Joseph Robins at his baking office at Cawston. N.B. No business will be required on Sunday & none need apply whose character will not bear the strictest investigation. A pair of French Burr Stones 4 ft. 6 ins. diameter. Apply to Joseph Robins at the Baking Office, Cawston, any day of the week except Sundays. To be Let. For a Term of Years with possession at Michaelmas next. 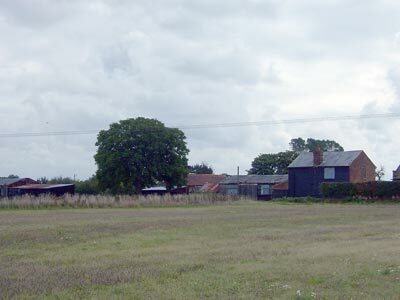 An Old Established BAKING OFFICE & WINDMILL with Dwelling house, Granary, Stables, Horse Mill, two acres of Arable Land & every convenience for carrying on the business of Miller & Baker with advantage & profit, situate in Cawston, in the occupation of Mr. Joseph Robins, the proprietor, who intends retiring from business. Application to be made to him (if by letter post paid) or personally on Mondays & Thursdays only. To be Sold by Auction by J. S. Woolmer on Thursday 14 April 1831 at the Woodrow Inn, Cawston at 5 o'c. A Capital Wood Smock Self Winding WINDMILL with two spring patent sails, driving two pair of French Stones with Flour Mill & Jumper & every requisite for carrying on the trade in the most efficient manner - together with 2 acres of Arable Land in the highest state of cultivation, situate in the populous parish of Cawston, Norfolk. All Freehold. At the same time will be LET by AUCTION an excellent Baking Office & 4 acres of Arable Land (in the same parish) now in full trade. The present proprietor & occupier of the above is declining trade & will give possession at Michaelmas next or sooner if agreed upon. Particulars of the Auctioneer, Reepham. Lot 2. A capital Freehold Smock Self Winding Windmill with patent sails & 2 acres of excellent Arable Land situate in Cawston aforesaid near the Town & on an eminence adjoining the Heydon Road. There is no other windmill nearer than Felthorpe or Aylsham. Lot 5. Two Freehold Brick built Dwelling houses & a long established Baking Office with flour chamber, granary, barns, stables & other requisite buildings & yards & gardens containing about half an acre in Cawston Street, now in the occupation of the Proprietor, Mr. Joseph Robins. Apply to Mr. Alfred Barnard, Solr. Norwich or the Auctioneer, Foulsham, Norfolk. A WOOD TOWER WINDMILL, with four Patent Sails, winds itself, driving two pairs of French Burr Stones, good as new, one pair of small Peak Stones, Flour Mill, Spur Wheel & Nuts in good going order. The owner is retiring from business. For particulars apply to James Winterbourn, Millwright, Aylsham. On Saturday (i.e. 22nd) about 10 pm. the inhabitants of the quiet little town of Cawston were alarmed by a fire which broke out in a tower windmill belonging to Mr. Samuel Pye. The upper portion of the tower being composed of wood & tar, was quickly one mass of flames, which were seen at a distance of twelve miles. Hundreds of willing hands were there to render assistance, but there being no supply of water near, nothing could be done to save the mill. Such was the nature of the fire, that had an engine with a good supply of water been there, it would have availed nothing owing to the materials being of such an inflammable nature. The mill was quickly a mass of ruins. Twelve sacks of flour & five sacks of meal etc. were completely destroyed. Overheating is assigned as the origin of the fire. We understand that the property is insured in the Norwich Union Office. Messrs. Spelman have received instructions to Sell by Auction on Saturday September 15, 1877 at 12 for 1 o’c At the Norfolk Hotel, Norwich, the FREEHOLD DWELLING HOUSE, Garden, Mill Walls, Barn, Stable, Garden & LAND containing 1a.2r.3p. occupied by Mr. S. Pye. Particulars of Messrs. Gedge, Kirby & Millett, Solrs. 1 Old Palace Yard, Westminster, London & of Messrs. Spelman, Norwich & Yarmouth. Mrs. Mary Ann Pye was still listed as baker in Kelly's Directory of 1900 and James Pye was listed as farmer & baker.